Please contact owner Howard at 239-283-7591. 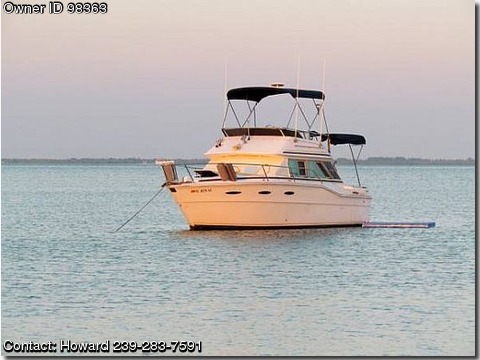 Boat is located in St.James City, Pine Island, Florida. 1985 boat has newer (2004)300 hp PCM 5.7 EFI fresh water cooled motors, newer 5.0 westerbeke Gen.(2011) All with low hours, marine A/C 12000 with reverse cycle heat, SS hot water heater 6 gal. Vacu Flush toilet, transom shower hot and cold, AC/DC refrig, new triple 20 amp charger,Microwave, elec two burner stove, full camper canvas, bridge cover, window covers and inside blinds, free fall windless 100 ft chain and 100 ft rope, 22&#39;&#39; flat screen TV w/DVD, 2 am/fm radio/CD players, 2 ship to shore radios. Sleeps six. needs detail done. NADA shows over 25000. with all the equipment.